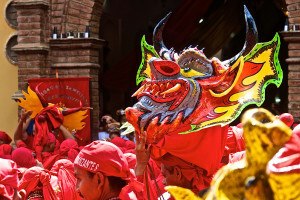 The Dancing Devils of Yare (Diablos Danzantes de Yare), a religious festivity representing the victory of good over evil through ritual dance performed by all male Dancing Devils, has been celebrated since the 18th century in San Francisco de Yare, Miranda State, Venezuela. 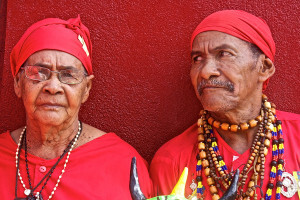 The Dancing Devils of Yare were recognized by UNESCO as an Intangible Cultural Heritage of Humanity in 2012. The Sociedades del Santísimo (Societies of the Holiest), the oldest brotherhoods in the American continent, are in charge of the celebrations. The brotherhoods are divided in hierarchical order, represented by the number of horns in their masks. 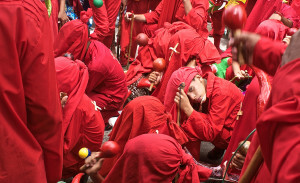 Their celebration costumes are composed of red shirts, trousers and stockings, a mask depicting a devil, scapulars, crosses, rosaries, and other sorts of amulets. 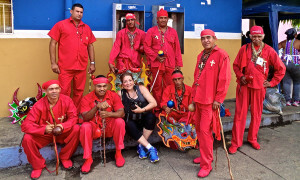 The Dancing Devils carry in one hand a devil-shaped maraca and in the other a whip. The folkloric festivity begins with devotion paid to the town’s patron Saint Francis de Paola, to the Blessed Sacrament, and to Jesus Christ as the devoted perform dances around the town’s main square and parade through the streets. Later in the day, they move towards the front of the main church and once mass has ended the Eucharist is placed at the church’s entrance, and a representation of a fight between the devils and the guardians takes place. Finally, the devils surrender and kneel in front of the Eucharist to show submission. This exhibition is a PhotoTapas event. Gina Santi was born and raised in Caracas, Venezuela. She graduated in Industrial Relations from the Universidad Católica Andrés Bello, Caracas. She studied photography at the Universidad Santa María, Caracas. She obtained her MBA from the Catholic University of America in Washington, D.C. and continued her photography training at the Washington, D.C. School of Photography. She earned her Education degree and her M.A. in Cultural Anthropology from Northern Arizona University. She teaches Spanish and Anthropology at the university level, and in her capacity as an educator, anthropologist and administrator she has worked, lived, and traveled in many countries, especially those where Spanish is the official language. PhotoTapas encourages collaboration and communication among galleries, photography-oriented organizations, and independent photographers within Arizona and beyond. The intent is twofold: to promote the art of photography throughout Arizona, and to celebrate the medium by offering the community a diverse sampling of engaging photography-related activities and events such as exhibitions, lectures, seminars, workshops, demonstrations and portfolio sharing.